Every month I used to crib that I receive my FabBag at the end of the month ,but was pleasantly surprised when I received the "The Date Night FabBag " before Valentine's Day .This month too I received my March FabBag before the 15th of the month .I hope this precedent continues in future too. 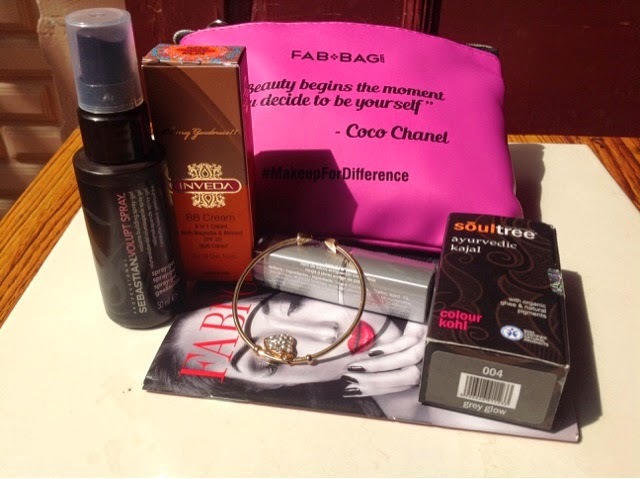 As you know the FabBag is a monthly subscription to beauty and makeup products chosen as per our needs delivered to our doorstep at a discounted rate which is about Rs 400 p.m.
First of all the a glimpse of the FabBag itself .It bore a beautiful message from the legendary Coco Chanel herself , as you can see below in the pics. 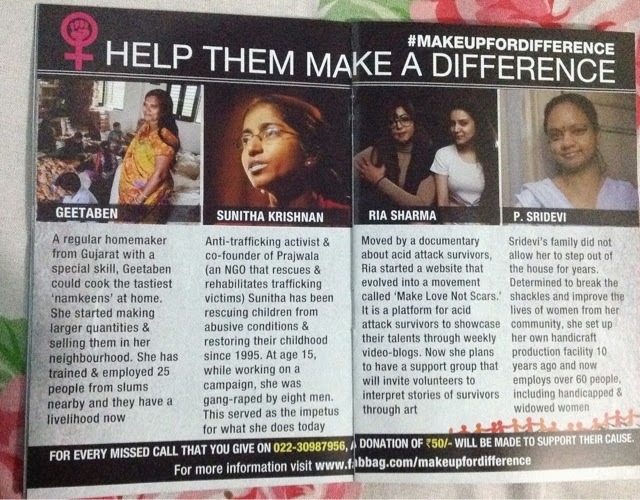 As you can see it's a bag filled with some fabulous products and has been labelled #MakeupForDifference March FabBag as this International Women's Day the FabBag has joined hans with NGO Milaap.org to raise money and awareness for causes led by four inspiring women .A donation will be made every time someone gives a missed call on 022-30987956 or share a message on www.fabbag.com/makeupfordifference . 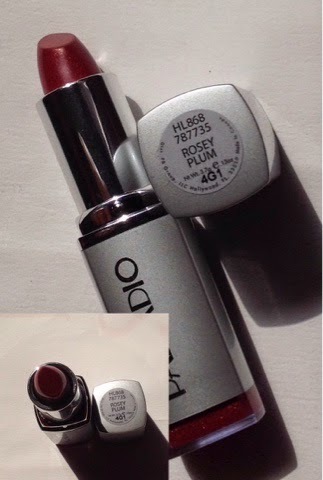 1.Palladio Herbal and Vitamin enriched Lipstick (worth Rs.650 )-Mine was Rosey Plum ,a deep reddish plum shade with some shimmer.It glides smoothly and gives decent coverage , feels creamy too and is herbal . 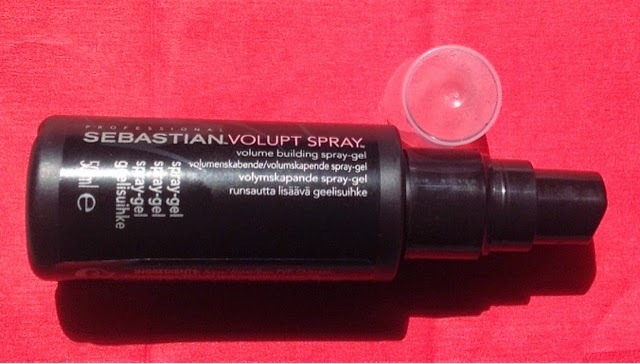 2.Sebastian Professional Volupt Spray( Rs 450/- for 50 ml sample )-Sebastian Professional is a concept oriented hair are and cosmetics company started by hair stylist Geriatric Cusenza( who also invented the crimping iron! 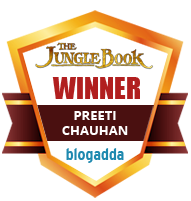 ).I am pretty happy to receive this product as I have flat , silky hair and I hope this will add the much needed volume to them. 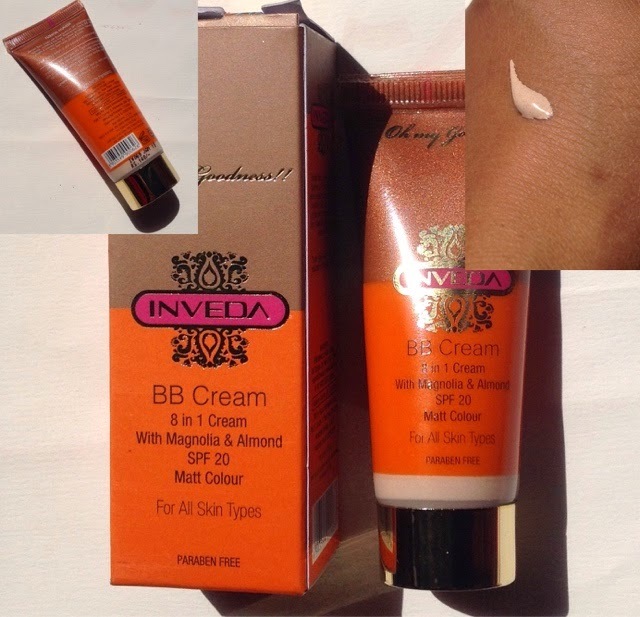 3.Inveda BB cream(Rs 140/- for 15 ml sample)-This is an 8 in 1 BB cream contains broad spectrum UV filters with Magnolia and almond extracts and gives a matte finish .It is free from parabens and free from cruelty to animals.It has no shade mentioned so I am assuming that it has a single shade for all complexions ,which is a sad fact for me .I found that it leaves a slight initial cast which then settles down to match the complexion .Though it was an exact match for me but I can't say about lighter and darker beauties. 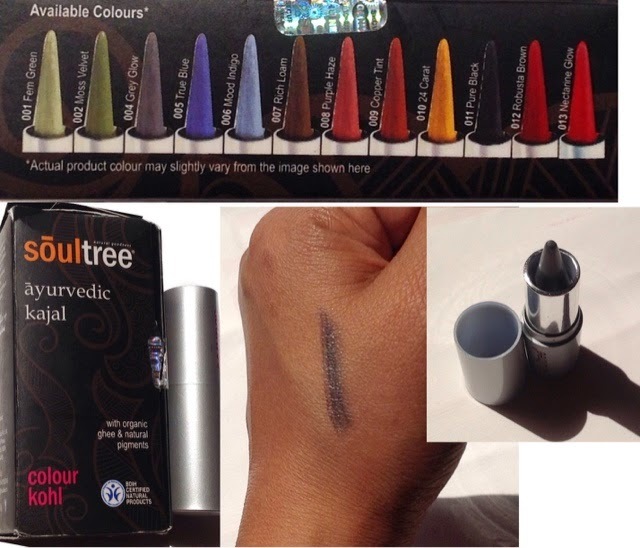 4.Soultree colour Kajal(Rs 350/- for full size )- I received the shade Grey Glow . 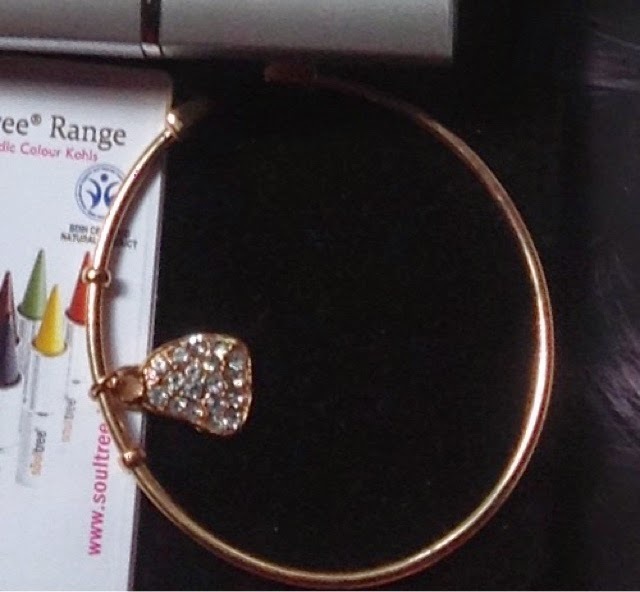 It is again a certified natural product with organic ghee and natural pigments .It comes in 12 exciting shades and since it is creamy and slightly shimmery , you can use it on your eyelids too . 6. 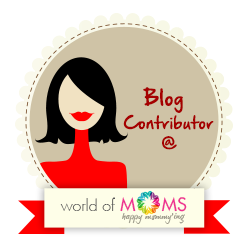 Fabpost - The monthly magazine that contains discounts to be availed on selected products and also information about products provided . That's all from me girls. My only request is ,"Please show your solidarity and support all these Fabwomen by giving a missed call or sending a message to them to strengthen their movements."